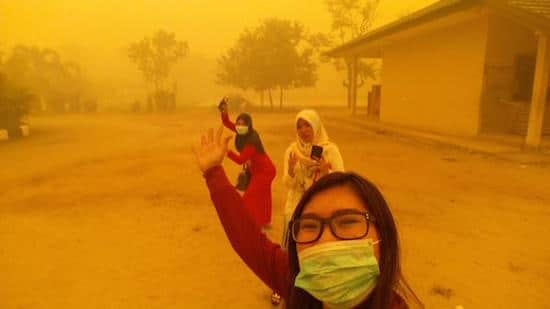 Some of the most devastating fires the world has ever seen are happening right now in Indonesia, and this unfolding disaster is getting little attention. Annual fires during the dry season have become typical in the last 20 years or so as slash and burn rainforest farming techniques have ravaged this once pristine part of the world, but now this year they are catastrophic. 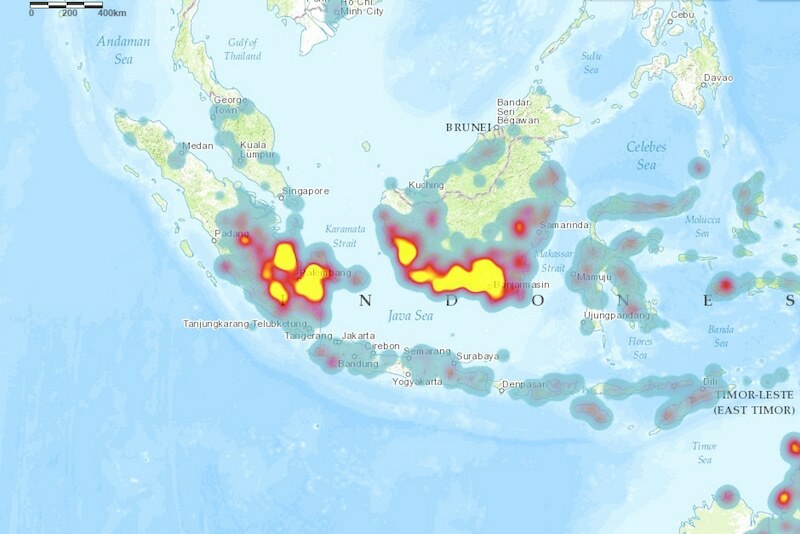 Some 5000 fires have burned in Borneo alone in just the last 2 months. This year’s fires are shaping up to be some of the worst fires on record, as a stretch of some 5000 km of land is burning, casting a deadly cloud of particulate haze over millions of people. 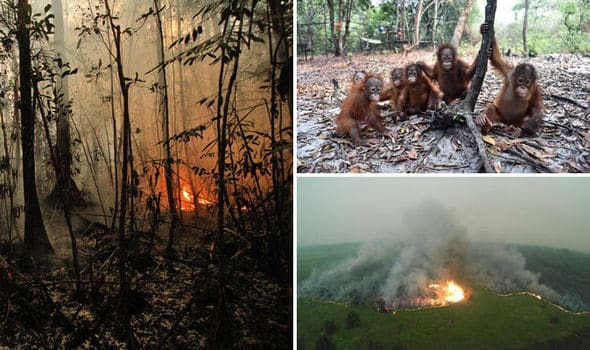 These types of fires are unique because it is not just the trees and vegetation that burn, as most of the fires are occurring in the vast tropical peatlands of the rainforest. 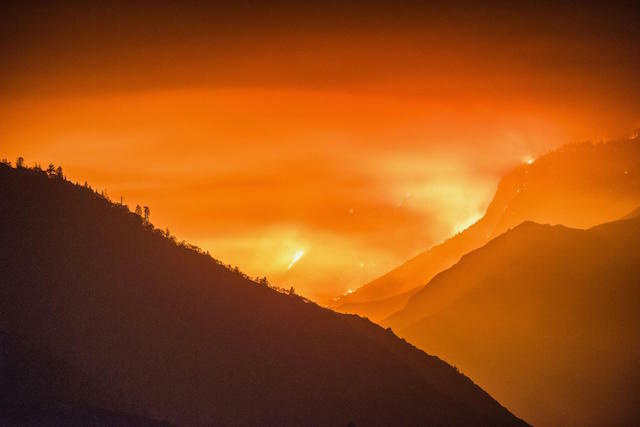 Here, the land itself actually catches fire, not just trees and vegetation, because great swaths of the forest sit on enormous eat domes that act as fuel under such dry conditions that have been exacerbated this year by the El Nino weather phenomenon. When the layers of peat are penetrated by fire, then they can smolder for weeks or even months continually releasing toxic gasses which extend for hundreds of miles. 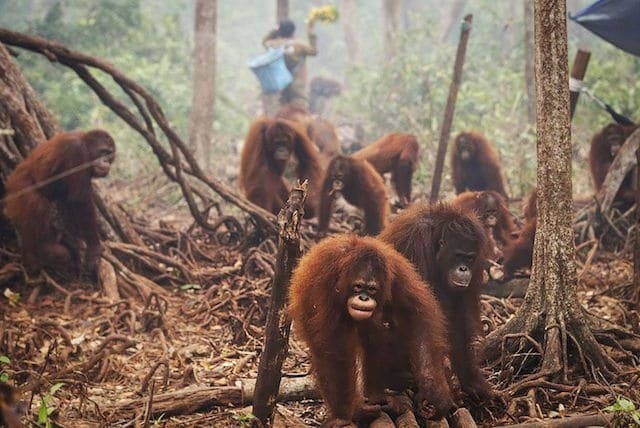 Tragically, the fires are devastating Indonesian Borneo and places like Gunung Palung National Park, home to some of the largest populations of orangutans on the planet. Several organizations are working tirelessly to evacuate trapped animals, but the toll on wildlife in Indonesia is already staggering. Some estimate that as many as 20,000 orangutans may be wiped out. Here is a short clip of aerial drone footage showing some of the burn areas of the forest in the last couple of months. The burned areas surrounding villages extend for miles and the loss in some areas is staggering, total. Footage is courtesy of GreenPeace International. The effect on cities and surrounding urban areas from the haze and particulate from the smoke is causing an extreme emergency, affecting millions of people. 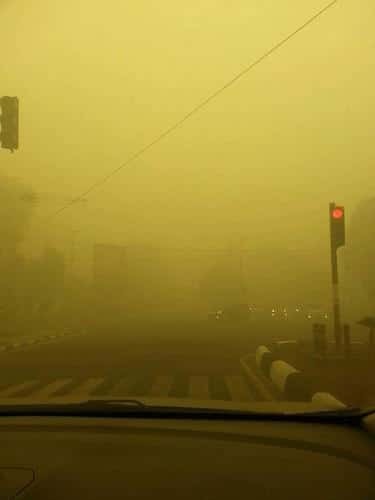 In the city of Palangkaraya, visibility has dropped to as low as 2o meters, and fatalities from respiratory problems are rising. An image posted on Twitter on Tuesday shows Palangkaraya at 2:47 p.m. local time. This article (The Eco-Apocalypse in Indonesia That No One is Talking About) was originally created and published by Waking Times and is published here under a Creative Commons license with attribution to Alex Pietrowski and WakingTimes.com. The Higher Mind, Nonlocal Intuition & Divine Synchronicities. What Does It All Mean?